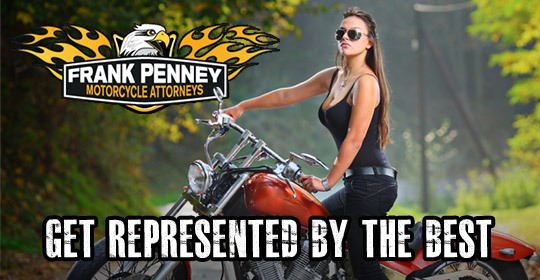 with Frank Penney Motorcycle Attorneys! When you’ve been in a motorcycle accident you need the most skilled and competent motorcycle accident attorney in the California area to help you navigate the complex web of insurance industry and judicial tactics, and advocate for your just compensation. With over 3000 personal injury cases settled within the last 10 years, Attorney Frank D. Penney’s reputation is well-known amongst insurance industry adjusters and attorneys. He knows how to properly assemble a motorcycle accident case, and is prepared prosecute your case in a court of law if the insurance companies don’t play fair. Frank’s law firm really does care about their clients. They took very good care of me and I know they’ll be there for me if I ever need their help again. Frank did a fantastic job! Keep up with motorcycle news and updates on our attorney blog. When you are in the market to purchase a motorcycle, you will have the option to buy either new or used. It is important to make the right decision in order to protect yourself and others on the road. Prevent a potential accident and injuries by educating yourself before you buy. It’s a law in California that all riders must wear helmets; and for good reason. Wearing a DOT approved helmet can reduce your chances of dying from a motorcycle accident by as much as 37%. In this post, Frank gives you some tips on how to choose the best helmet and potentially save your life.